These perforated steel park benches are a modular design with bold, large diameter steel tube frames and perforated steel seating surfaces. The modularity provides unlimited add-on capability. 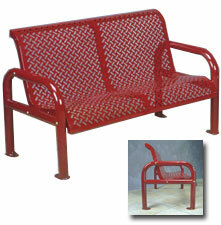 Designed for both comfort and durability, the frames are constructed using 2-3/8" galvanized steel tubing supporting the 13 ga. perforated steel seating. 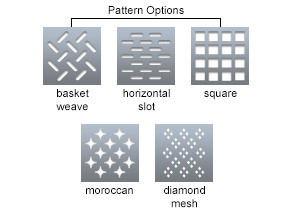 The perforated steel seating is available in several perforation pattern options as shown below. All hardware is stainless steel.